Project managers who are getting close to social security age may remember when flow charts were done using little green, plastic templates provide by IBM on quad ruled paper (am I showing my age?). Guess what? Flowcharts are back as part of management efficiency initiatives called Business Process Management (BPM). Before you groan and start flipping through your Dilbert calendar, let me assure you that project managers can benefit significantly from the results of successful BPM and besides, you have seen it before under a different guise. In the 1990s, companies were encouraged to think about their business activities as processes rather than functions or departments. BPM is about optimizing a repeatable process for speed, quality and compliance with organizational strategies. Movement of paper, people and materials are fair game for BPM systems. How is process mapping done? Interviews, observation and procedure manuals are places that BPM professionals collect the series of steps that comprise a process. 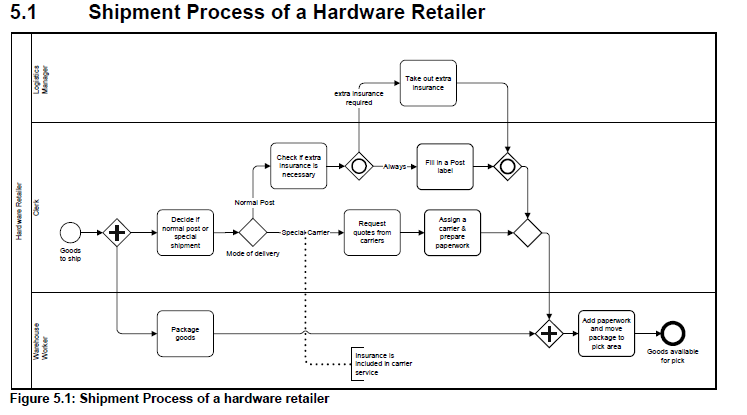 They use tools that derive from system engineering to represent a process including flow charts, functional flow block diagrams, swimlane diagrams, UML and recently, Business Process Modeling Notation, which is overseen by Object Management Group/Business Process Management Initiative. The process maps form the BPM’s “as is” documentation and bear striking resemblance to the software project activities in business and user interface analysis. However, because BPM’s focus is on process improvement, they collect additional information in process mapping such as time-on-task, training requirements and materials. Think about the old time and motion studies done in the 1920s. Here’s an example of a process map using a swimlane representation that I borrowed from Federal Enterprise Architecture Program Management Office, OMB. I know you cannot read the little print, but you get the idea that tasks are linked (vertically) executed across time (horizontally) in swimlanes of individual responsibility such as accounting clerk, manager, receptionist etc. Here is where the rubber meets the BPM road. The analysis of the data collected during process mapping helps identify bottlenecks, sources of delay, duplications, unnecessary steps and confused authority. A “to-be” process is created and tested to remove process problems and optimize flow. However, just like in project management, some fixes create their own problems. Therefore, BPM systems continue to collect data, chart new processes and feedback on improvements and challenges. Many tools exist to help collect and analyze business processes as well as simulate alternatives. What do project managers get out of a BPM initiative? Organizations with optimized processes are more agile. Efficient processes within an organization often lead to improved customer and client relationships. Simulations based on proposed “to-be” processes supports testing changes on your project before committing resources to implementation. Automation of some processes reduces errors, improves throughput and can positively affect regulatory compliance; suggested by Microsoft in their Business Process Management Overview. Has your organization gone through a BPM review and process improvement? Are you trying to implement collaborative tools to replace manual processes? Then you should think about having a BPM analysis done as the first part of your project. Are there BPM tools or a tool suite you find particularly useful? Please share. I started my project life in the late 90s and we started everything with process mapping and analysis. Not just to discover requirements, but to help business case new projects. In the years since the I have only increased my appreciation for process modelling and its often where I go when investigating stalled/red projects. It’s really important for companies to make a distinction between the business processes and functions of departments. In your post you have demonstrated a brief summary of BPM, while focusing the reader on the necessity of using process mapping in projects. I liked this post, thanks.